(MEDFORD, OR – March 8, 2019) – All Care In-Home Care Solutions is pleased to announce the grand opening of their new office location in Medford, OR on March 16. The office is located at 255 West Stewart Avenue, Suite 101 in Medford and will serve clients in the surrounding area. All Care is an in-home care agency that has been providing seniors and adults with disabilities high quality and affordable access to in-home care throughout the Rogue Valley for 25 years. The company is owned and managed by brother and sister team, Ali Dean and David Pearlstein. The new, centrally-located office allows space for a caregiver training center that is fully-equipped for comprehensive, hands-on caregiver training. The space will serve as All Care’s central office and house customer service, nursing, employee development, human resources, accounting, and scheduling departments. All Care’s Medford office is one of three locations in Southern Oregon; the agency also has offices in Grants Pass and Klamath Falls. All Care In-Home Care Solutions is an in-home care provider serving Medford, OR and the surrounding Rogue Valley area. All Care offers non-medical services in the home such as personal care, meal preparation, housekeeping, and transportation, as well as nursing services, Alzheimer’s and dementia care, end-of-life comfort care, and more. All Care accepts Medicaid, VA Benefits, Long Term Care Insurance, and Private Pay. To learn more about All Care In-Home Care Solutions, visit their website at allcareonline.com or call the Medford office at (541) 857-9195. Beaverton, Or, March 15 SOFT LANDINGS, SOLUTIONS FOR SENIORS has been awarded the Circle of Service designation by the National Association of Senior Move Managers (NASMM). The Circle of Service designation is bestowed on Senior Move Management companies that have been NASMM members, in good standing, for a minimum of five years, and have shown consistent dedication and support of the National Association of Senior Move Managers and the Senior Move Management profession. Over 50 Senior Move Management companies from across the United States, the United Kingdom, Australia and Canada received the Circle of Service designation this year. The awards ceremony took place during the National Association of Senior Move Managers 2019 Annual Conference in San Diego, California in early March. Soft Landings helps with all the aspects of downsizing including space planning, de-cluttering, sorting, move management, packing, unpacking and more! The National Association of Senior Move Managers (NASMM) is a not-for-profit, professional association of organizations dedicated to assisting older adults and families with the physical and emotional demands of downsizing, relocating, or modifying their homes to safely age in place. As the only professional association of its type devoted to helping the rapidly increasing 55+ population with middle and later lifestyle transition issues, NASMM members are committed to maximizing the dignity and autonomy of all older adults. NASMM is internationally-recognized for its innovative programs, leadership and expertise on issues related to Senior Move Management, transition and relocation issues affecting older adults. For more information, visit www.nasmm.org. The National Association of Senior Move Managers (NASMM) announced Soft Landings, Solutions for Seniors has been awarded the NASMM A+ Accreditation for its excellence in Senior Move Management operations and client services. This is in addition to the SMM-C, Senior Move Management Certified designation. Soft Landings, Solutions for Seniors, based in Beaverton and serving the tri-county area, is part of the Best of the Best in Senior Move Management. Move management is a relatively new field that began in response to a need to help older people transition from large homes to smaller homes or adult living communities. Soft Landings, Solutions for Seniors assists families with as much help or as little help with the sometimes-overwhelming tasks of downsizing and moving. They provide services for move management, sorting, space planning, packing, unpacking and setting up a home. They also provide services for emptying out the former home including arranging for the sale, donation, and disposal of items no longer needed. In addition, they often provide services needed for staging the former home and decorating the new home. Founder Theresa Giddings, CPA (retired), CFP™, started Soft Landings, Solutions for Seniors in 2013 to address the need for seniors to have trustworthy, compassionate help throughout the downsizing and moving process. She wants seniors to make the key decisions, Soft Landings, Solutions for Seniors, to guide them with gentle expertise. The Springs Living today announced Chief Operating Officer Jay Leo has been promoted to President. Company Founder Fee Stubblefield, who held the concurrent titles of President and Chief Executive officer, will continue as CEO. An MBA graduate of Arizona State University, Leo has contributed to the success of the Company’s steady expansion as it grew from five senior living communities when he started in 2010 to 17 in 2019. As President, Leo will focus on the Company’s operational structure and systems, key measurements, and quality and performance predictability. His expanded role is especially important as the company finalizes construction on new, innovative senior living communities in Lake Oswego, Oregon and Bozeman, Montana, and undertakes major renovations on other properties in 2019. Leo joined the senior housing sector after his time at Intel Corp where he held analyst and management positions. While at The Springs Living, he worked his way from Executive Director of The Springs at Tanasbourne, to Director of Operations at the home office in McMinnville, Oregon. He was named Chief Operating Officer in 2016. Leo serves as an active board member of the National Center for Assisted Living, and on the Future Leaders Council of the National Investment Center for Seniors Housing & Care. The Springs Living is a locally owned senior housing company headquartered in McMinnville, Oregon and founded in 1996. With a purpose to positively change the way people experience senior living, The Springs Living offers independent living, assisted living and memory care within most communities. For more information visit www.TheSpringsLiving.com. The Oregon Department of Veterans’ Affairs (ODVA) is uniting a volunteer force to connect aging veterans to their earned benefits. Why? There are over 330,000 Oregonians who have served in the military. Two thirds of these veterans are not receiving health care from the VA and fifty three percent of them are over the age of 65. Many of these men and women could benefit from state, local, and federal services. ODVA is currently launching the Volunteer Veteran Guide Program in Clackamas and Polk Counties with expansion to other counties to come. If ensuring veterans and their families receive the county, state and federal veterans’ benefits they have earned sounds exciting to you, we’d like to have you join our team on this mission! We’ll train, mentor, and help you along the way. Together we can make a difference in the lives of our veterans. We are pleased to welcome Tina DeYoung to our marketing team as the Marketing Director. Tina comes to us with extensive industry knowledge and a love for our senior population. Her passion for her job is apparent in everything she does. “I met Tina months ago at an industry event, and immediately loved her joyous and real spirit. I am so excited to work with her,” says our Community Outreach Specialist, Rebecca Boehm. Please come visit our beautiful building and welcome her. You can find us at 520 112th st SW Everett, WA 98204. Our coffee bar is always open and we would love to chat. Jennifer Kitchens has returned to us with the new title “Customer Service Leader.” You probably have already talked to Jennifer as she was the receptionist who greeted each caller with “Hello! How can I make your day better?” Jennifer’s new role is to be our Customer Service Leader. She will be active and intentional in gathering, analyzing, and understanding customer service perception of those we serve. I want to do a better job of this so adjustments in service can be made to optimize customer satisfaction. She will also be managing the front office staff and assisting in admissions. Jessica Treat has recently stepped into the role of Community Development. She is out in the community promoting Josephine’s services and gaining understanding of related services in our area. In the past few months she has forged strong relationships with community leaders and referral sources. She has brought great information on what is happening in our healthcare service area back to Josephine. This knowledge will be useful as we build and move new services. Kati Shannon is returning to us as the new business development and marketing director. Her role is to do whatever needed to get new business up and running then market those businesses. Former Supreme Court Justice Sandra Day O’Connor continues to demonstrate her leadership in the face of adversity, today bravely announcing her diagnosis of dementia, possibly Alzheimer’s. In all aspects of her life Justice O’Connor has been a transparent leader, and being forthcoming about her diagnosis is another demonstration of this. Justice O’Connor is not new to Alzheimer’s. Her husband, John O’Connor, lived with Alzheimer’s disease for nearly 20 years. In 2005, as John was in decline from the disease, Justice O’Connor stepped down from the Supreme Court to spend more time with him. Our hearts go out to Justice O’Connor and her family as they face this devastating disease. Since her husband’s diagnosis with Alzheimer’s disease, Justice O’Connor has been an advocate for caregivers and people living with the disease. She was a pivotal member of the Alzheimer’s Study Group, a committee convened by Congress and which presented its findings back to Congress in 2009. Justice O’Connor helped to position Alzheimer’s as a national priority that demands action from our nation’s policymakers. She provided invaluable insight and passion to the group ensuring the needs of both caregivers and those living with dementia were represented. Justice O’Connor testified twice to Congress on the group’s recommendations which helped to inform policies enacted today. More than 5 million Americans are living with Alzheimer’s disease and another 16 million are providing unpaid care. The most expensive disease in the nation, Congress has recently taken unprecedented steps to improve the trajectory of this devastating disease — including more than quadrupling Alzheimer’s and dementia research funding at the National Institutes of Health (NIH) and improving access to care and support services. We commend Justice O’Connor for bravely sharing her diagnosis and increasing awareness about this devastating disease. The Alzheimer’s Association is the leading voluntary health organization in Alzheimer’s care, support and research. It is the largest nonprofit funder of Alzheimer’s research. The Association’s mission is to eliminate Alzheimer’s disease through the advancement of research; to provide and enhance care and support for all affected; and to reduce the risk of dementia through the promotion of brain health. Its vision is a world without Alzheimer’s. Visit alz.org, or call 800.272.3900. 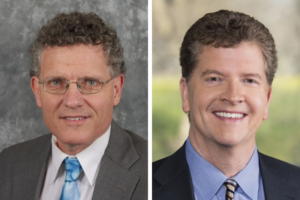 Salem Health Hospitals & Clinics recently welcomed two health care leaders to its board of trustees. David Harrison, MD and Phil Jackson began serving their three-year terms in early October. Dr. Harrison grew up in Chicago. He earned his undergraduate degree from Yale University, and then attended medical school at the University of Virginia. He completed his radiology residency and magnetic resonance imaging fellowship at Massachusetts General Hospital in Boston. After finishing his training, Dr. Harrison worked for nine years as a radiologist at a small Harvard teaching hospital, where he became associate chief and directed the MRI program. He took a sabbatical in 2004, working as a radiologist in New Zealand. He joined Salem Radiology Consultants in August 2005. Dr. Harrison’s wife, Joyce Millen, is an anthropology professor at Willamette University. They live in Salem with their daughter Maya. Dr. Harrison’s outside interests include traveling, hiking, running and birding. He also serves on the boards of the Oregon Chapter of the Nature Conservancy and the American Bird Conservancy. Jackson has been a leader in health care systems for four decades. He is currently CEO of Sutter Health’s Health Plan Products. He previously spent nearly 30 years with Washington-based Providence St. Joseph Health. After leadership roles at Providence Health Plan, Jackson moved into medical group management. He served as chief operating officer, vice president of physician services and, finally, chief integration and transformation officer for the California region while at Providence Medical Group. Jackson served as president and CEO of Oregon’s Health CO-OP before moving to his current role at Sutter. He earned a bachelor’s degree from Portland State University and a master’s degree from the University of Texas at Austin. Dr. Harrison and Mr. Jackson are expected to bring a multitude of skills and expertise to the Salem Health board of trustees. They are both expected to begin their tenure in October. About Salem Health: Salem Health offers exceptional care to people in and around Oregon’s Mid-Willamette Valley. It comprises hospitals in Salem and Dallas, a medical group of primary and specialty care providers, plus other affiliated services. Visit them at www.salemhealth.org; “Like” them on www.facebook.com/salemhealth; follow them on Twitter: @salemhealth; and view them at www.youtube.com/salemhealth. More information: Salem Health media relations, available 24/7 at 971-718-3157. The Oregonian has once again named Salem Health Hospitals & Clinics a Top Workplace in Oregon and Southwest Washington. This is the third year in a row the health care system has earned this honor. Becoming a place people consider a top workplace doesn’t happen on its own. It’s the product of hard work and many years of focused effort. Salem Health intentionally works to build a unique workplace culture that attracts diverse, caring and talented people. This culture embraces transparency and empowers employees to drive workplace improvement on a daily basis. Many organizations solve problems at a management level, forcing change downward. Salem Health believes it is those on the front line doing the work and caring for patients who are best positioned to drive continuous improvement. Every voice matters at Salem Health, so the entire organization uses the tools of Lean management to encourage every employee to submit ideas and solve problems. The end result is a constantly improving process that benefits patients and employees. Salem Health’s culture relies on trustworthy leaders and dependable co-workers. Every employee has meaningful work to do, contributing a piece to the compassionate care provided to patients. These ingredients help create an exciting and satisfying workplace. The culture at Salem Health is bolstered by competitive pay and benefits, investments in continuing education and pride that comes from delivering award-winning care. Salem Health is the premier health care provider for Oregon’s Willamette Valley. Made up of hospitals in Salem and Dallas, a medical group of primary and specialty care providers, plus other clinics and services — it has provided pioneering medicine since 1896. It is also Salem’s largest private employer, with more than 4,500 employees. There are more than 700 practitioners on the active medical staff, representing 46 different specialties. In addition, more than 400 people provide non-medical support as hospital volunteers. Salem Health is a community-based, not-for-profit institution. The board of trustees comprises 15 volunteers who share a common belief: To heal the sick and injured — not to answer to stockholders. Salem Hospital is one of the largest of Oregon’s acute care hospitals, licensed for 454 acute-care beds and operating the busiest emergency department in the state. About Salem Health: Salem Health offers exceptional care to people in and around Oregon’s mid-Willamette Valley. It comprises hospitals in Salem and Dallas, a medical group of primary and specialty care providers, plus other affiliated services. Visit them at www.salemhealth.org; “Like” them on www.facebook.com/salemhealth; follow them on Twitter: @salemhealth; and view them at www.youtube.com/salemhealth.